June marks the beginning of Obon season on Maui, when Japanese missions and temples host obon dancing and festivities throughout the island. Obon celebrations honor those who have passed and are also gatherings for the community that are enjoyed by all ages, regardless of one’s ethnic heritage. Monday, June 1 – June 7. Hemp History Week. 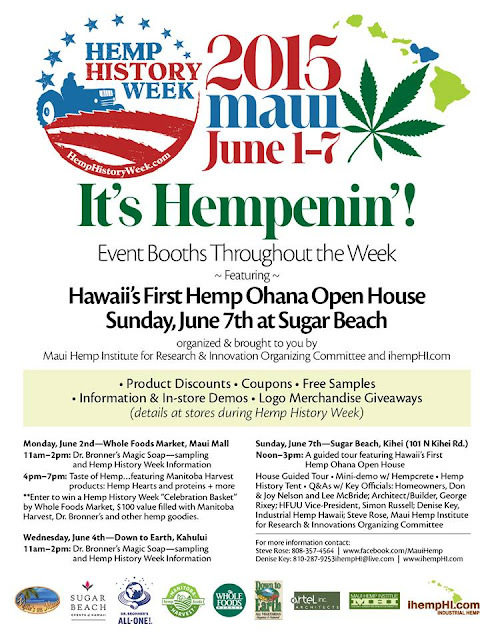 Giveaways, samples and information booths at different locations on Maui. Guided tours on Sunday to the Hemp House in Kihei. FREE! Tuesday, June 2, 6:30 – 8 pm. Buddha’s Birthday at the Maui Dharma Center, Paia. Full moon gathering and donations will be accepted for the Nepal relief efforts. Tuesday, June 2, 5 – 7 pm. Hawaiian Plants for Liver Health. Down to Earth, Kahului FREE! Tuesday, June 2, 6 – 8 pm. Mahina’ai Night. Learn about the island of Kaho’olawe, take a guided walking tour, enjoy live music, look at artifacts from the island. 2780 S. Kihei Road, by the Kihei boat ramp, Kihei. FREE! Wednesday, June 3 – Sunday, June 7. Maui Film Festival. Screenings of select films and nightly festivities including “A Taste of Chocolate.” Various locations in Wailea and at the MACC. If you go to the Celestial Cinema, bring comfy folding chairs and a waterproof blanket! My experience at the Celestial Cinema. Wednesday, June 3, 6 pm. Wild Food Potluck. Makawao. Contact the organizers for directions. FREE. Friday, June 5, 6 pm. “Talk Story” on the Land: Hawea Point Moonlit Hike. Kapalua. Suggested donation: $25. Friday, June 5 – Sunday, June 7. Wa’a Kiakahi Hawaiian Sailing Canoe Festival. An opportunity to learn about traditional Hawaiian sailing canoes. Event features a sailing canoe race, ceremony, free rides, and education about ancient navigation methods. FREE! Friday, June 5 – A Celebration of Gemini. Concert by the Papa Mali Band, dance party, and laser entertainment at the Sacred Earth Temple, Haiku. Tickets $40+. Saturday, June 6. 10 am – 1 pm. Japanese Cultural Society’s Quarterly Event: Free Obon Dance Workshop. Learn about bon or obon dancing, learn a few different types of dances, and learn about the significance of obon season. $8, includes lunch. June 6 is the first obon dance this summer, in Lahaina, at the Lahaina Shingon Mission. FREE unless you want lunch. Saturday, June 6, 8 am – 4 pm. Volunteer at the Auwahi Forest Restoration Project to weed, plant, and maintain native forest. See the hala pepe plant fruiting. Meet at the Ulupalakua Ranch Store. Saturday, June 6 – Sunday, June 7 – Maui Jim OceanFest. Competitive ocean sports sprint style event with multiple races and categories. Challengers are coming from all over the world. Kaanapali. Sunday, June 7, noon – 3 pm. 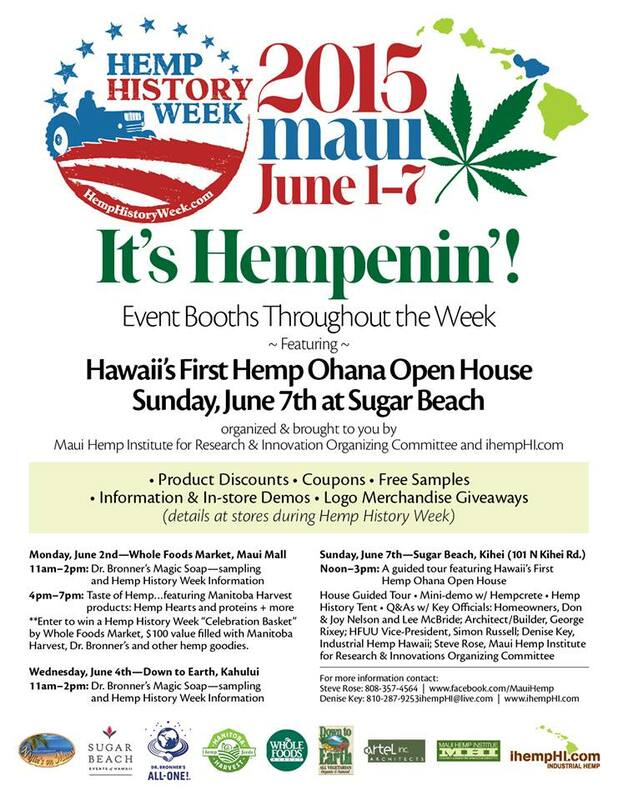 Hemp Ohana Open House, part of Hemp History Week. Guided tours to the first house made of hemp on Maui. Kihei. FREE! Thursday, June 11 – June 14. Kapalua Wine and Food Festival. The longest running wine and food festival in the US. Ticket prices vary. Thursday, June 11, 5 pm – 6:30 pm. Sound Healing with Aromatherapy for the Chakras at the yoga room, Lumeria Maui, Makawao. Saturday, June 13. 9 am – 5 pm. 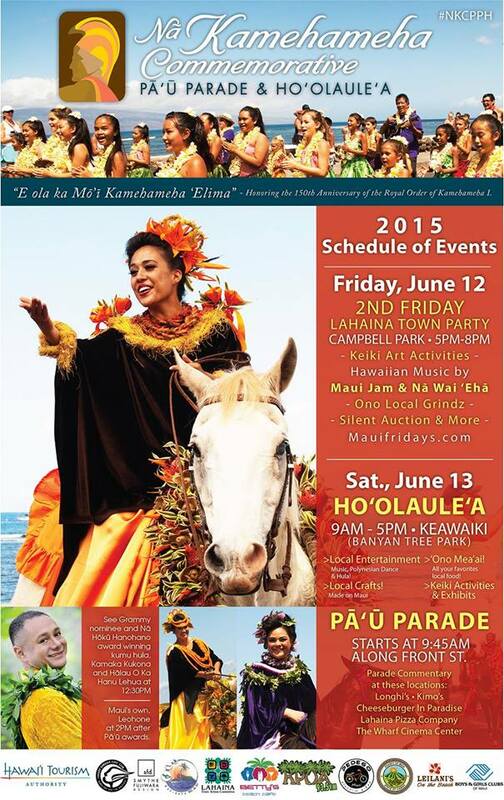 Kamehameha Day Parade and Celebration. Parade with pa'u riders (festive Hawaiian costumes and leis on the horses), farmers market, crafts, music, and celebration. Lahaina. FREE! Saturday, June 13. 7 – 10 pm. Swingin’ Tiki Time with Eric Gilliom. Mulligans on the Blue, Wailea. An exotic journey through Hawaii’s musical past. $20+. Saturday, June 13 – Sunday, June 14. Maui Upcountry 4H Livestock & Ag Fair aka the Upcountry Fair. Olinda. Details TBA. This is usually a two day event, and has what you'd expect at a farm fair including rodeo events. Here's a blog post about the Upcountry Fair. FREE! Saturday, June 13, 11 am – 2 pm. Juneteenth, a cultural day honoring African Americans. Kamaole III Beach, Kihei. Learn the history of this holiday, enjoy cultural activities, drumming, soul food, games, and more. FREE! Friday, June 12 – Sunday, June 14. Writing From Your Soul – Maui. A weekend workshop to write and publish your book with Wayne Dyer and Hay House Publishing. Saturday, June 20, 8 am – 8 pm. Summer Solstice Love Jam. Celebrate summer solstice all day at the Maui Yoga Shala with free yoga and dance classes, live music, craft and food vendors, and fire spinning after sunset. FREE! Saturday, June 20, 11 am – 2 pm. Hawaiian Island Land Trust Family Picnic. Annual community and family picnic with live music by Kaniala Masoe, take guided tours around the wetlands, enjoy a picnic and watch Plein Air artists paint on the land. FREE! RSVP to (808) 244-5263 or info@hilt.org. Waihe’e. Saturday, June 20, 2 pm – 11 pm. Summer Solstice at Ahimsa Sanctuary Farm, Haiku. Dinner and farm tour are optional. Saturday, June 20, 4 pm – 7 pm. Feast Hawaii presents Feast: Fire, in celebration of Father’s Day and Summer Solstice. Farm to Table Dinner and Salsa Dance Lesson. Maui Tropical Plantation, Wailuku. Thursday June 25, 6:30 to 8:30 pm. Community Talk Story About Cane Burning. Hawaiian leaders, doctors and scientists discuss cane burning. Learn its history and culture on Maui and how it impacts your health, the environment, and the economy. Kihei Community Center. Thursday, June 25. 6 pm – 7:30 pm. Hawaiian Music Series. Outdoor concert at the Baldwin Home Museum, Lahaina. FREE! Friday, June 26 – June 30. Maui Qi Fest. Workshops in tai chi, qi gong, massage, yoga, shaolin, and other modalities. Ke’anae. Sunday, June 28, 1 pm – 7 pm (Please double check the time closer to the event date.). Ki Ho’alu Hawaiian Slack Key Guitar Festival or http://mauiarts.org/ki_hoalu_festival. MACC. FREE! Saturday, June 27, 6 pm to 6 am. American Cancer Relay for Life. War Memorial, Kahului. Saturday, June 27. 2 – 4 pm. Hali'imaile Community Garden potluck and open house. Potluck event is open to the public. Visit the garden and see what's growing. FREE! Tuesday, June 30. 5- 8 pm. Social Media Day. Maui Brewing Company, Kihei. Tuesday, June 30. 9:30am. AfricanAmerican Dedication Ceremony at Kepaniwai Park, Iao Valley, Wailuku. Dedication of an African American monument to the multicultural park in celebration with Juneteenth, an African day of freedom. 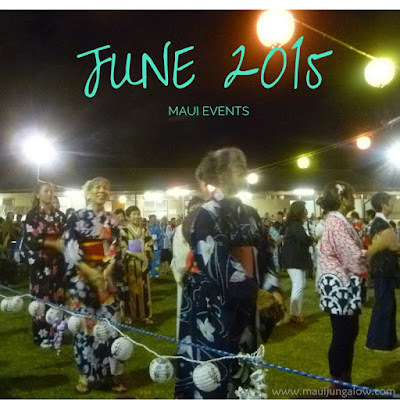 1st, 2nd, 3rd, and 4th Fridays of the month: Maui Friday parties, held in a different town each week. More info at www.mauifridays.com. FREE! WOW - Wailea on Wednesday: On Wednesday nights at the Shops of Wailea, there is usually a concert or other entertainment. 6:30 – 8 pm. FREE! Labyrinth walks, on or near the full moon each month and on Thursday afternoons at the Sacred Garden of Maui, Makawao. www.sacredgardenmaui.com. Donations accepted. Hawaii Farmers Union public potluck meetings – held on the 3rd Thursday of the month, usually at the Maui Tropical Plantation and the 4th Tuesday of the month at Haiku Community Center. More info at HFUU Haleakala on Facebook, closer to the day of the meeting. FREE if you bring a dish to share! There are many other events on Maui at Calendar Maui, Maui Time, and Meet Up. Oh definitely! It's hard to keep up! Hawaii's trying to get hemp legalized. It almost passed this spring, so we're hoping it gets passed in the next legislative season.